Sen. Lindsey Graham (R., S.C.) is poised to lead the Senate Judiciary Committee after Sen. Chuck Grassley (R., Iowa) announced he is stepping aside from that role to become chairman of the Senate Finance Committee. 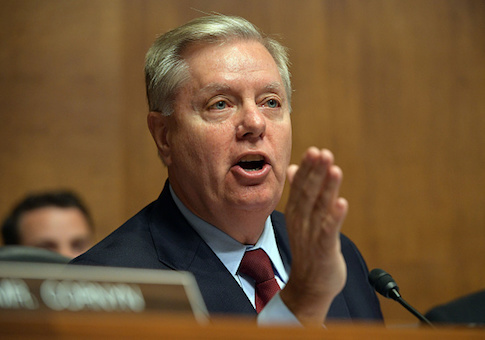 Graham would oversee judicial confirmations if he becomes Judiciary Committee chairman. Grassley said he would work for more tax relief as Finance Committee chairman, the Associated Press reports. Graham said in September he would remember how Supreme Court Justice Brett Kavanaugh's confirmation process played out if he was to become committee chairman. "If I am chairman next year, if we keep the majority and Senator Grassley (R., Iowa) moves over–and I hope he doesn't because I think he's done a great job–I'm going to remember this," Graham said. Senate Majority Leader Mitch McConnell (R., Ky.) said his top priority in the new, divided Congress will be confirming President Donald Trump's judicial nominees. "We intend to keep confirming as many as we possibly can for as long as we are in a position to do that," McConnell said. Since Trump was elected, the Senate has confirmed two Supreme Court justices and dozens of circuit court and district court judges. Pending a hand recount in Florida's Senate race, the GOP is expected to increase its Senate majority by two seats, to 53 total, when the next Congress begins in January. The two additional seats increase the likelihood McConnell will get conservative justices through the Senate confirmation process. This entry was posted in Politics and tagged Brett Kavanaugh, Chuck Grassley, Lindsey Graham, Mitch McConnell. Bookmark the permalink.